Walkie-talkies have been around for decades, and they haven't changed drastically in years. OnBeep, a company that launched a wearable push-to-talk device called Onyx today, wants to bridge the gap between clunky hand-held sets and smartphones. At 46 grams—about the weight of an egg—Onyx is a clip-on receiver and transmitter that tethers to an iOS or Android app, which allows you to form groups of users quickly and share information like location with the whole group. 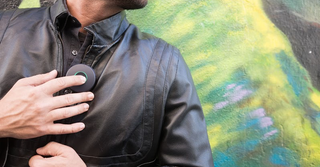 The idea is to take classic walkie-talkie functionality and overlay new features thanks to the app; OnBeep also compares its device to a Star Trek communicator badge: Clip it to your chest and slap it to talk. The company's CEO Jesse Robbins, a volunteer firefighter and EMT, clearly had first responders in mind, but the company is also pitching the peripheral as a consumer product that could be used amongst friends at a music festival or co-workers running around town during the workday. In the pitch video, we see a family planning a last-minute surprise party. It's easy to see how Onyx would help you avoid the frustration of the endless back-and-forth calls and group texts, but it's unclear whether it's worth the extra cash for the hardware versus using an app like Zello, which pitches itself as "easier than texting and faster than calling."